Kevin Dobson has proven you can have both safety and performance on a rig; it doesn’t have to be one or the other. Dobson, a Rig Manager on our team, has led Rig 57 to over 600 days without a recordable incident – all while drilling record holes for depth and size in the area where the rig is deployed south of Fort McMurray, Alta. 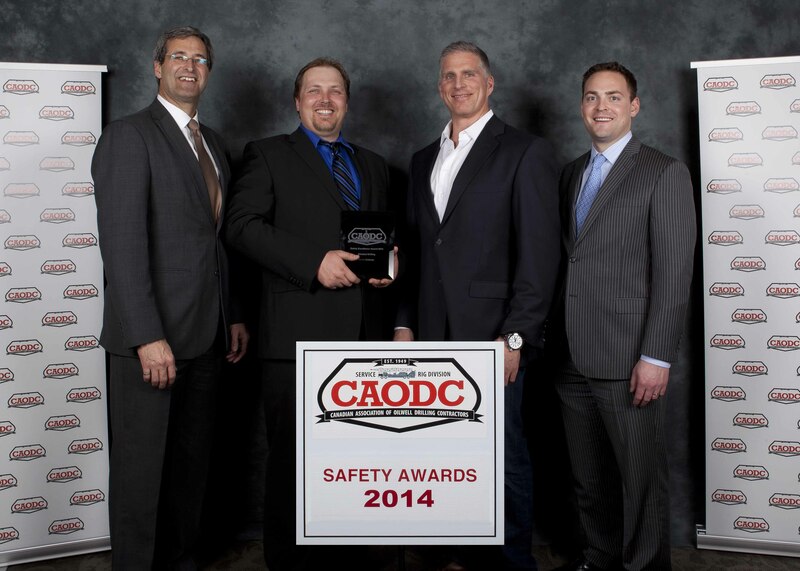 Dobson’s commitment to safety is the reason he received this year’s CAODC Safety Excellence Award for Trinidad Drilling. Every spring, the Canadian Association of Oilwell Drilling Contractors (CAODC) presents safety awards after the winter-drilling season. This tradition has been going on for 34 years. Safety scrolls are given to senior crew members who lead their teams to 200 consecutive days without a recordable incident. Stand-out crews are also nominated by their companies to receive special Safety Excellence Awards (what Dobson received). Kevin Dobson (second from left) receives his award. Darryl Hostyn, HSE Manager for Trinidad’s Canadian Drilling Division, explained that Rig Managers are in the field with their crews every day, so their leadership is key to a safe rig. “If (the Rig Manager’s) shack is untidy or he has a poor safety attitude, the rest of the crew will follow his lead. If the Rig Manager does not document and follow procedures, everyone will do the same,” said Hostyn. Hostyn explained that Dobson leads by example. When Dobson climbs a derrick, he puts on his harness and gear, and he won’t let any member of his crew climb up until they have done the same. The father of five from Saskatchewan, who has been on our team for 10 years and oversaw the Rig 57 build, is committed to training workers properly. “Kevin also believes in retention and tries to keep steady crews. Your best producing and safest crews are ones that stay together,” said Hostyn. Dobson is always looking for opportunities to improve the safety culture of his rig. If he sees room for improvement, he takes the initiative to implement a better process or procedure, and he ensures the methods are captured and relayed to the safety department for review and distribution. Dobson is such a valued member of our team, we’re putting him in charge of Rig 58, which will be one of the largest and most technically advanced land rigs in North America once it is built. Rig 58 should be completed this August. Read more about Rig 58 in this Rig Spotlight. Our fleet of advanced rigs and our well-trained crews make our safety culture one of the best in the industry. We have 41 per cent fewer workplace incidents than the Canadian industry standard. The advantage to working with Trinidad is we’re committed to keeping you safe at work, plus you get to work on fresh iron while receiving great benefits and industry-leading training.